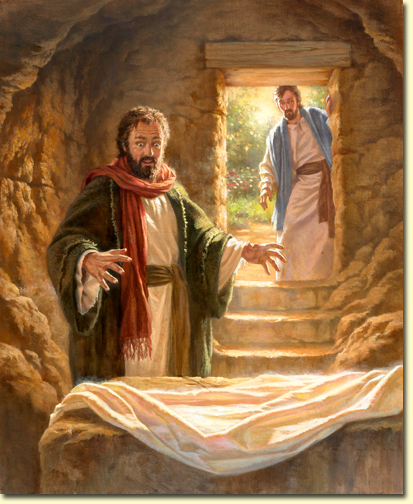 When Simon Peter arrived after him, he went into the tomb and saw the burial cloths there,and the cloth that had covered his head, not with the burial cloths but rolled up in a separate place. For they did not yet understand the scripture that he had to rise from the dead.” -John 20:1-9. The mystery of Christ’s resurrection is a real event, with manifestations that were historically verified, as the New Testament bears witness. In about A.D. 56 St. Paul could already write to the Corinthians: “I delivered to you as of first importance what I also received, that Christ died for our sins in accordance with the scriptures, and that he was buried, that he was raised on the third day in accordance with the scriptures, and that he appeared to Cephas, then to the Twelve. . .” The Apostle speaks here of the living tradition of the Resurrection which he had learned after his conversion at the gates of Damascus. “Why do you seek the living among the dead? 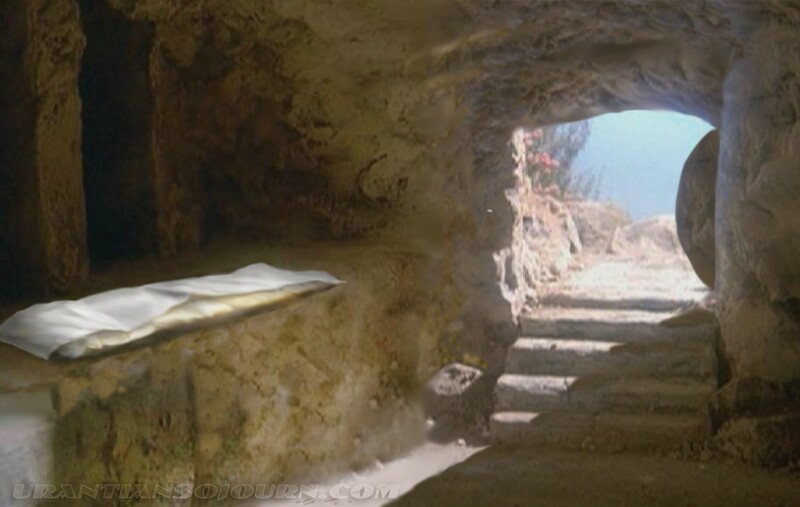 He is not here, but has risen.” The first element we encounter in the framework of the Easter events is the empty tomb. In itself it is not a direct proof of Resurrection; the absence of Christ’s body from the tomb could be explained otherwise. Nonetheless the empty tomb was still an essential sign for all. Its discovery by the disciples was the first step toward recognizing the very fact of the Resurrection. This was the case, first with the holy women, and then with Peter. The disciple “whom Jesus loved” affirmed that when he entered the empty tomb and discovered “the linen cloths lying there”, “he saw and believed”. This suggests that he realized from the empty tomb’s condition that the absence of Jesus’ body could not have been of human doing and that Jesus had not simply returned to earthly life as had been the case with Lazarus. Everything that happened during those Paschal days involves each of the apostles – and Peter in particular – in the building of the new era begun on Easter morning. As witnesses of the Risen One, they remain the foundation stones of his Church. the faith of the first community of believers is based on the witness of concrete men known to the Christians and for the most part still living among them. Peter and the Twelve are the primary “witnesses to his Resurrection”, but they are not the only ones – Paul speaks clearly of more than five hundred persons to whom Jesus appeared on a single occasion and also of James and of all the apostles. Even when faced with the reality of the risen Jesus the disciples are still doubtful, so impossible did the thing seem: they thought they were seeing a ghost. “In their joy they were still disbelieving and still wondering.” Thomas will also experience the test of doubt and St. Matthew relates that during the risen Lord’s last appearance in Galilee “some doubted.” Therefore the hypothesis that the Resurrection was produced by the apostles’ faith (or credulity) will not hold up. On the contrary their faith in the Resurrection was born, under the action of divine grace, from their direct experience of the reality of the risen Jesus. By means of touch and the sharing of a meal, the risen Jesus establishes direct contact with his disciples. He invites them in this way to recognize that he is not a ghost and above all to verify that the risen body in which he appears to them is the same body that had been tortured and crucified, for it still bears the traces of his Passion. Yet at the same time this authentic, real body possesses the new properties of a glorious body: not limited by space and time but able to be present how and when he wills; for Christ’s humanity can no longer be confined to earth, and belongs henceforth only to the Father’s divine realm. For this reason too the risen Jesus enjoys the sovereign freedom of appearing as he wishes: in the guise of a gardener or in other forms familiar to his disciples, precisely to awaken their faith. Christ’s Resurrection was not a return to earthly life, as was the case with the raisings from the dead that he had performed before Easter: Jairus’ daughter, the young man of Naim, Lazarus. These actions were miraculous events, but the persons miraculously raised returned by Jesus’ power to ordinary earthly life. At some particular moment they would die again. Christ’s Resurrection is essentially different. In his risen body he passes from the state of death to another life beyond time and space. At Jesus’ Resurrection his body is filled with the power of the Holy Spirit: he shares the divine life in his glorious state, so that St. Paul can say that Christ is “the man of heaven”. Christ’s Resurrection is an object of faith in that it is a transcendent intervention of God himself in creation and history. In it the three divine persons act together as one, and manifest their own proper characteristics. the Father’s power “raised up” Christ his Son and by doing so perfectly introduced his Son’s humanity, including his body, into the Trinity. Jesus is conclusively revealed as “Son of God in power according to the Spirit of holiness by his Resurrection from the dead”. St. Paul insists on the manifestation of God’s power through the working of the Spirit who gave life to Jesus’ dead humanity and called it to the glorious state of Lordship. “If Christ has not been raised, then our preaching is in vain and your faith is in vain.” The Resurrection above all constitutes the confirmation of all Christ’s works and teachings. All truths, even those most inaccessible to human reason, find their justification if Christ by his Resurrection has given the definitive proof of his divine authority, which he had promised. Christ’s Resurrection is the fulfilment of the promises both of the Old Testament and of Jesus himself during his earthly life. The phrase “in accordance with the Scriptures” indicates that Christ’s Resurrection fulfilled these predictions. The truth of Jesus’ divinity is confirmed by his Resurrection. He had said: “When you have lifted up the Son of man, then you will know that I am he.” The Resurrection of the crucified one shows that he was truly “I AM”, the Son of God and God himself. So St. Paul could declare to the Jews: “What God promised to the fathers, this he has fulfilled to us their children by raising Jesus; as also it is written in the second psalm, ‘You are my Son, today I have begotten you. '” Christ’s Resurrection is closely linked to the Incarnation of God’s Son, and is its fulfilment in accordance with God’s eternal plan. Saint Nicholas of Flue was born in Switzerland of pious parents. One day, when he saw an arrow launched on a neighboring mountain, he was filled with a desire for Heaven and with love for solitude. He married, to obey the formal will of his parents; he and his wife Dorothy became the parents of ten children. His merit and virtue caused him to be chosen by his fellow citizens to exercise very honorable public functions. He was fifty years old when an interior voice said to him: Leave everything you love, and God will take care of you. He had to undergo a distressing combat, but decided finally to leave everything — wife, children, house, lands — to serve God. He left, barefooted, clothed in a long robe of coarse fabric, in his hand a rosary, without money or provisions, casting a final tender and prolonged gaze on his loved ones. 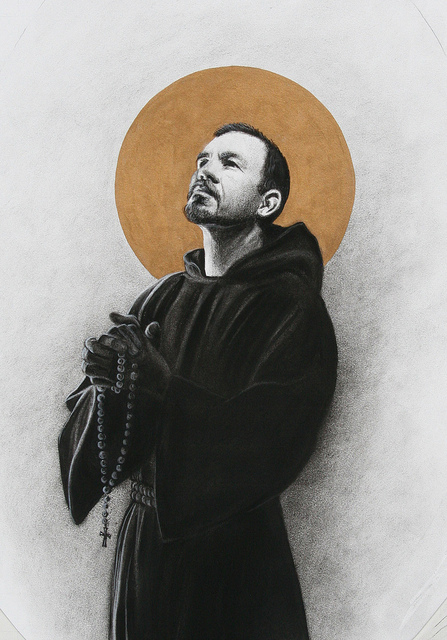 His habitual prayer was this: My Lord and my God, remove from me all that can prevent me from going to You. My Lord and my God, give me all that can draw me to You. One night God penetrated the hermit with a brilliant light, and from that time on he never again experienced hunger, thirst or cold. Having found a wild and solitary place, he dwelt there for a time in a hut of leaves, later in a cabin built with stones. The news of his presence, when it spread, brought him a great influx of visitors. Distinguished persons came to him for counsel in matters of great importance. It may seem incredible that the holy hermit lived for nineteen years only by the Holy Eucharist; the civil and ecclesiastical authorities, startled by this fact, had his cabin surveyed and verified this fact as being beyond question. When Switzerland for a moment was divided and threatened with civil war in 1480, Saint Nicholas of Flue, venerated by all, was chosen as arbiter, to prevent the shedding of blood. He spoke so wisely that a union was reached, to the joy of all concerned, and the nation was saved. Bells were set ringing all over the country, and the concerted jubilation echoed across the lakes, mountains and valleys, from the most humble cottage to the largest cities. At the age of 70, Saint Nicholas fell ill with a very painful sickness which tormented him for eight days and nights without overcoming his patience. He was beatified in 1669 by Pope Clement IX, canonized in 1947, by Pope Pius XII.